Or … How to Increase Business at Your Bar with the DAR Daughters and a Six Shooter. The moral of this story is that DAR ladies should not allow their portraits to be displayed at places of ill repute, such as the back bar of the Black Forest Inn, where they risk the unfortunate fate of this innocent DAR lady (PICTURE) immortalized in Richard Avedon’s pop portrait of “The Generals of the Daughters of the American Revolution.” The DAR lady’s portrait now serves to attract bar hoppers and other curiosity seekers to the Black Forest Inn where they ask to finger the bullet hole in her head. Richard Avedon’s black and white photograph was taken at the 1963 NSDAR Convention, at the Mayflower Hotel, in Washington D.C. The original “without gunshots” portrait may be seen HERE and there is more information about the shooting at The Rake, November 2004. 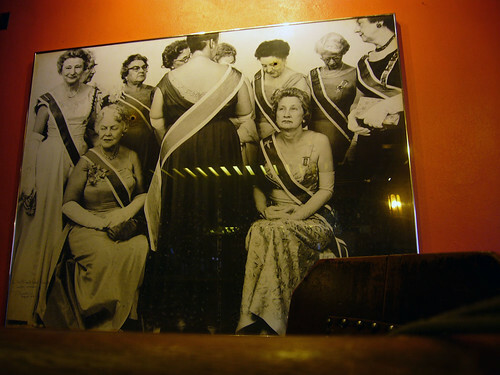 The image, Richard Avedon’s “Daughters of American Revolution” at the Black Forest Inn, is subject to copyright by TedSher. It is posted here with permission via the Flickr API by barneykin. This entry was posted on Saturday, January 26th, 2008 at 9:31 am and is filed under America, business, humor, photography. You can follow any responses to this entry through the RSS 2.0 feed. Both comments and pings are currently closed.